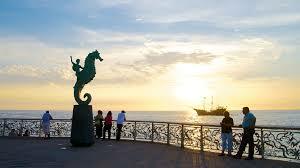 The Malecon Puerto Vallarta, also referred to as the Boardwalk, is one of the most iconic places in town. Always bustling with tourists and locals alike, there is never a lack of things to do here. My family loves walking the malecon just before sunset and watching the magnificent display when the sun goes down for the day. Or if you are really lucky, catch a glimpse of a whale breaching off the coast. There are many great restaurants and bars are located on the malecon so stop in and have a great meal or a drink and enjoy the sights and people watching. Or stop into the many stores with anything from fine jewelry to souvenirs. Walk the malecon anytime of the day and you will find vendors with wonderful local food and drinks or artisans flocking their wares. Local talent is always to be found performing. Whether it is the actors pretending to be statues or the Papantla Bird-Men swinging above there is always lots of entertainment. 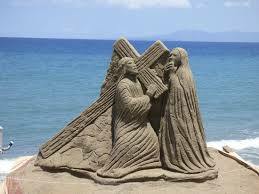 Make sure to stop and look at the artists sculpting beautiful sand and rock creations. And most nights you can find live entertainment for free in the amphitheatre or dancing and music in the town square. And while on your walk make sure to stop and look at the many beautiful sculptures on the malecon from local and internationally renowned artists. 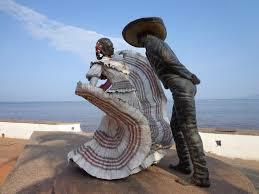 A trip to Puerto Vallarta is not complete until you visit this beautiful part of town.